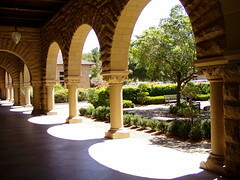 This week Angela is in sunny California, attending the Diagrams 2006 Conference on the beautiful Stanford Campus, which leaves me at home alone. Don't worry 'bout ol' Pete - I'm a one man amusement park. Why just yesterday I was thinking of all the things, other than TV, I could do around the house. Welcome to the Not-Dating Game where contestants attempt to out do each other's inane pass times. Bachelor #1, what kind of entertainment do you like when you're alone? Ummm… I like to rent movies, forget about 'em, then, like, remember I have them around 10PM and watch them until I fall asleep. Unless there's a game on - like now - (raising his fists and pumping them in an ape-like fashion above his head) - WORLD CUP!!! Woooooooo hooooooo!! Am I right? Go England! Woooohooo!!! Okay okay, settle down now, ha ha, what fun. Now Bachelor#2, what kind of meal do you like when you're alone? well, steak and frites, but you know frites some times take awhile... you gotta cut up the potatoes and what not. Or ribs. They take awhile too. hmmm… maybe ribs. No, steak. Okay, well put, lots of thought put in that, great. Bachelor#3, what's your favorite beverage for your "alone time" - something you really like to treat yourself to? It had been a bad day. My salty summer cold had taken a turn for the worst. My throat felt like hot asphalt embedded with broken glass, my teeth felt as if each one had a deeply bored cavity (thanks to my congestion). Incongruously, despite nasal blockage one might find at the Hoover Dam, my nose dripped a clear, gelatinous fluid. Worse yet, as I had neglected to fill my asthma prescription, I felt like a very fat man was sitting on my chest, making breathing a concentrated effort. When I finally got my 'scripts filled, there was no immediate relief. As these drugs act cumulatively it would take 2-3 days before I felt better. Cumulatively. It was this word that made me wonder what drugs and substances I had 'accumulated' during that day. So here it is, a clear listing of the known amounts of medicinal and non-medicinal ingredients I took over a sixteen hour period. Notably, the first four lines are things I take everyday. Oddly, the scariest part of the list is the non-medecinal part. 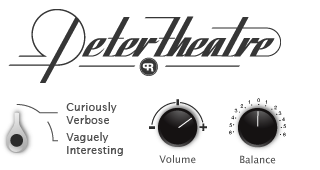 Polyethylene? That was the coating of Sinutab pills. The same plastic used in Coke bottles and shopping bags? Wax? Camphor? Ammonium carbonate? This is just the stuff to keep the pills together but still - you have to wonder, is it doing more harm than good? One thing probably did more harm than good. I see I inadvertently took a triple dose of the decongestant pseudoephedrine hydrochloride by taking a dose of Buckley's in the morning and two Sinutab capsules at night. It works by reducing the swelling of mucous membranes (ewww) in your nasal passages - but this drying out of your mucous leaves you dry, very dry. So dry, that you now lack your body's built-in protection from dust spores and other allergens. In other words, you are now more susceptible to things that may trigger an asthmatic episode. Bingo! Oh well, (barely) live and learn. Awhile ago I decided to do a sketch a day. Needless to say it didn't go far. If I found it hard to find time to do a sketch, it would be impossible to do the sketch then scan and post it. Instead, I've decided to just post a few as I have time or that are worth a look. 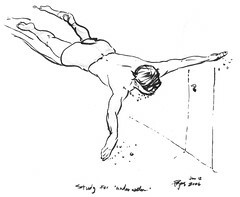 This drawing of a swimmer is from a story about characters who interact at a community swimming pool. I haven't been to the pool lately but anyone who swims at a public pool knows the variety of people you meet. There may be too much there for one story. 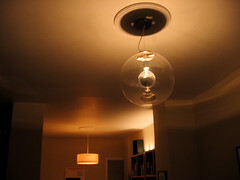 This is our new living room light. In the background is our new dining room light. The significance of the living room fixture is that it replaces the last remaining light on the main floor from the previous owner. Now I don't want to judge the taste of others, but for me that old living room light hung over my head like a dark cloud - a dark cloud in the shape of an amber/bronzey/faux Victorian fly trap. Needless to say, I sleep better knowing the old light is now in the basement - except now I'm afraid to go down into the basement - for it lurks there still - lurking, waiting to illuminate a room in an unattractive manner. Click on the photo to see some more photos from May.